White Tern: Medium-sized tern, also called Common Fairy-tern, snow white overall, dark eyes and black eyerings make it appear to have large eyes. Notched tail. Wings and tail may appear translucent when overhead. Bill is black with dark blue base, legs and feet are blue-gray. 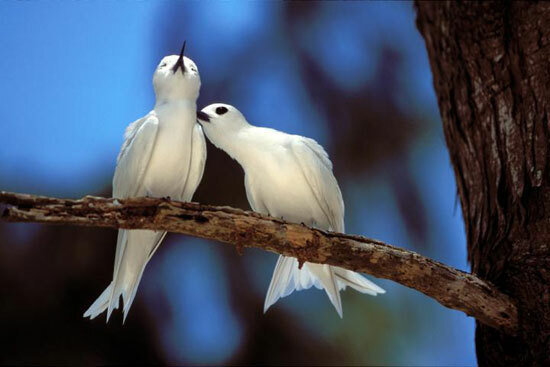 White Tern: Found along the southern coast of Oahu and in city parks where they can become quite tame. Nests and roosts in trees of dense forests or low vegetation. The White Tern was first described in 1786 by Anders Erikson Sparrman, a Swedish naturalist. It is also known as the Common Fairy-Tern and White Noddy. It often lays its egg in the fork of a tree with no nest to support it. A group of terns are collectively known as a "ternery" or a "U" of terns.